ArcGIS Indoors is a geo-enabled system for smart workplace operations. The system allows operators to unlock workplace data at every scale, enhancing their understanding of occupant needs, to deliver a safer, more productive workplace. ArcGIS Indoors includes a web application and mobile application (iOS, Android) for viewing the 3D maps, data, and location information. 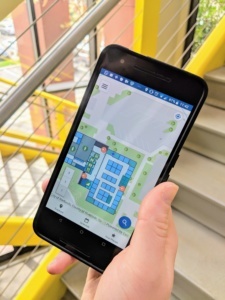 The system is great for facility owners, operators and occupants who can use ArcGIS Indoor’s mapping capabilities to streamline, optimize, locate, and share indoor information. With unlimited user access, the Indoor maps are accessible by all occupants, visitors, and employees. ArcGIS Indoors is tightly integrated with the ArcGIS Platform. Used in combination with Survey123 for ArcGIS and GeoEvent Server, operators can maximize efficiency with real-time streaming and analytics of workplace data. Additionally, ArcGIS Indoors is powered by ArcGIS Pro and ArcGIS Portal, and its capabilities can be extended to leverage other aspects of ArcGIS Infrastructure and third party systems. Let us help you deploy ArcGIS Indoors. Our team can assist with curating and preparing data, authoring maps and scenes for Web and Mobile Apps, and configuration and deployment of Indoors Apps. In addition, we also provide custom solutions to extend the platform, integrate it with third party systems, and customize the UI/UX (branding, colors, icons, images). Our team is trained on the latest ArcGIS Indoors features. Having recently completing a hands-on workshop at Esri’s main campus in Redlands, CA, Blue Raster is ready and able to bring this exciting technology to your organization. Contact us to hear about our ArcGIS Indoors services and solutions!